Brighton is pretty awesome. We’ve been a few times now. The first time was for a romantic weekend away. We stayed in a fabulous B&B called The 21 which had a hospitality tray to die for (you have to see it to believe it). We shopped, we strolled, we ate, we frolicked…the way carefree couples do. The second time, I think I was about six months pregnant. Kind of a last hurrah before entering the world of parenthood. We returned to The 21 and had a fabulous time – though I did a little less frolicking with my growing bump. Our third visit was With Child, when Ethan was about 4 months old. Although he was extremely good (thank God), we felt a little bad about the sheer amount of equipment and luggage we came bearing for such a short stay. Matt and Andy, owners of The 21, were so lovely about it though, and very accommodating. For October half term, we wanted to get away for a couple of nights. A change of scenery is always good for the soul, right? And we decided on Brighton because it is so easy to get to. Although we chose to drive, there are plenty of trains that go from London St Pancras, and there is now even a direct train from Letchworth, which is so handy for us. We got stuck in traffic on the way home so we’ll probably take the train next time! We really lucked out with the weather. The sun shone the entire time. We made a last minute reservation at Jury’s Inn Brighton, which is located at the top of the hill behind the train station. If you book here, be mindful there is also a Jury’s Inn Waterfront – make sure you don’t make the same mistake as us and head to the wrong one! A touch embarrassing but they assured us that many people make the same mistake. 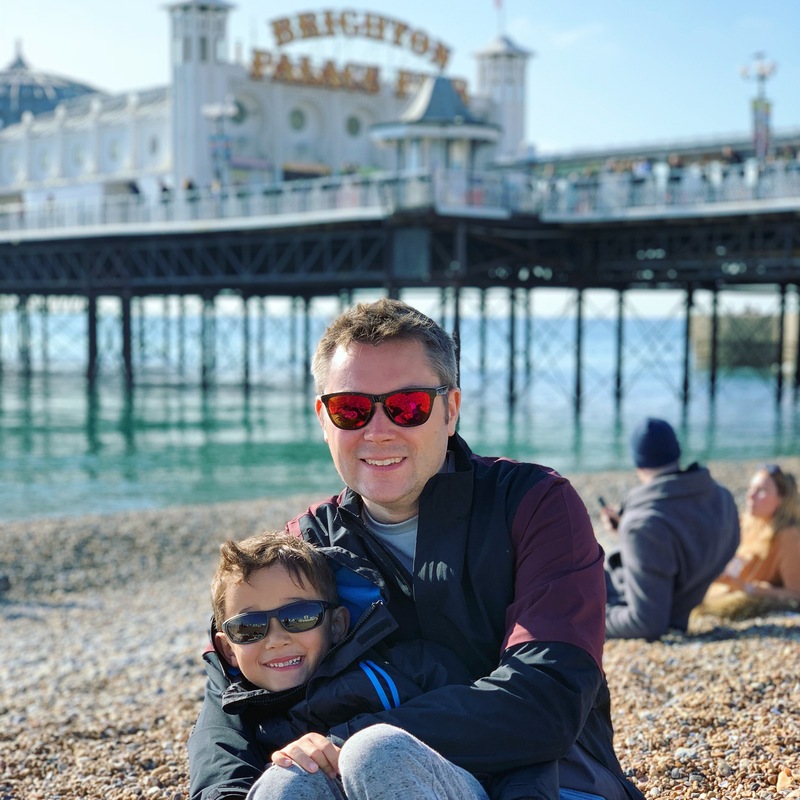 I thought I would share a few of things we enjoyed doing in Brighton, in case you decide to head there for a family weekend away. I never went to arcades as a child but my husband did and loved them. We took Ethan for the first time about a year ago and he absolutely loved it. He tries to recreate his favourite arcade games at home, and spends hours making long lines of tickets for us to win. Whether you love them or hate them, arcades are a staple of any visit to the British seaside. Push some pennies, spin the wheel, score some baskets…and have some good old fashioned fun. Top tip: The first arcade you reach along The Pier is much better than the second one, which is smaller and set within the soft play complex. We tried both and won a lot more tickets at the first – plus there is a bigger selection of cheaper games at the first arcade. Tom and Ethan really enjoyed skimming stones at the beach. Such a simple activity but it entertained them for ages. I realised my stone-skimming skills weren’t up to much, so I headed across the road to get a box of chips from Harry Ramsden’s. I had a major chip craving and Harry Ramsden’s is meant to be the best place to go. I brought them back and we ate them together on the beach. Top tip: While it’s great eating chips on the beach, beware of the seagulls! We saw them getting a bit feisty with some fellow chip-eaters, but luckily they ignored us. Obviously there are so many delicious places to eat in Brighton. We wanted to visit somewhere different to the usual high-street chains, so we decided to try Tookta’s Thai restaurant which came highly recommended on TripAdvisor. It’s located on a residential street, away from the typical touristy areas. It was a little tricky to find but was definitely worth it! The restaurant is small, intimate and friendly. The food was really fresh – even Ethan, who is super fussy, enjoyed it. We love Thai food anyway, but we would definitely return here. Top tip: We were there midweek so it was quieter but I would definitely recommend booking if you’re planning a visit at the weekend as there aren’t that many tables. Ethan’s big love is golf, so wherever we go, we always check if there is a good adventure golf course. Tom looked online and found Jungle Rumble Adventure Golf which was brilliant. It’s a fair walk along the seafront (probably 15-20 minutes from The Pier) but definitely worth doing as the course is so much better than the tiny mini golf near The Pier. There is somewhere you can buy drinks and snacks, and if you climb up the stairs, you can sit at tables with stunning views. Perfect if the sun is shining. Top tip: If you can’t face the walk back to the city centre, hop on the little train that passes by. Trains run every 15 minutes, the fare isn’t much, and it will take you most of the way back. Plus the kids will love it! You can buy tickets for this at the same cafe where you pay for the adventure golf. The Lanes are a must-see when you visit Brighton – twisting, winding narrow roads that you can casually explore all day long. While The Lanes near the sea-front are more high-end high street shops, North Laine has over 400 smaller, independent shops where you’ll find all kinds of original and creative things to buy. Top tip: If little legs are getting tired, stop at Cafe Coho for a tasty homemade sausage roll and some delicious cake. I don’t know how often ‘the bubble man’ makes an appearance but let’s just say, he was a huge hit when we were there! We found him on the beach, right near the British Airways i360 (which we haven’t been on yet but looks fun) and he made the most amazing bubbles we have ever seen. All the children absolutely loved it. It’s a great distraction if you want to have a well-deserved sit-down while the kids jump around chasing the bubbles. Top tip: This is a good place for a toilet stop! There are plenty of toilets and baby change facilities within the British Airways i360 visitor centre. So those are our suggestions for fun, family activities in Brighton if you’re heading there for a weekend away. I hope you find them helpful. Have you been to Brighton? If you have any suggestions to add, please comment below, we’d love to hear them.